- EX air Shinobibachi added in game. Invincible until hit detection comes out. Producer Yamamoto says: We’ve balanced her as a female ninja by giving her attacks that can make her fight more tricky from the air. Using Ukibane to trick the opponent and doing an attack string, or hit confirming from her crouching fierce punch have become effective tactics. Her Neomax has also been buffed. Mai returns to KOFXIII after being absent from the games previous installment. As of now, Mai has a lot to offer in regards to her overall game play. Mai's mobility, pokes, air control, and mix ups should take priority when mastering her. Mai has really good buttons, most of which have very good priority and utility. Mai also has several safe options for special moves such as her Kachosen (qcf+P projectile) and her Ryuuenbu (qcb+P). Mai has the ability to zone and dish out relative safe pressure, while she can also resort to great keep away and rush down thanks to her mix ups and speed. Mai is one of the faster characters of KOFXIII so taking advantage of her mobility will help the player succeed in winning. The characters overall weakness is that she does not have many reversal options without meter and she has trouble doing a lot of damage at mid screen. Mai's damage output will increase exponentially if she manages to corner the opponent and if she has meter available. Mai is very good at controlling space with her normals, both on the ground and in mid air. She also has a rather noteworthy CD/j.CD attack that allow her to pressure her opponent carefully. There are also many threatening tools to be aware of when playing Mai affectively, such as her air throw, her j.d.B, the majority of her EX moves, her EXDM, CD attacks, her poking tools, and her Neo Max. Overall, Mai is a particularly strong character who will provide players with a very interesting game play style altogether, thanks SNKP doing a very good job in providing Mai with a refreshing outlook on her game play. st. A: 25 damage, chain/cancel-able, hits mid. A quick standing horizontal poke, very fast and is cancel-able and it chains into s.A again or s.B. st. B: 30 damage, hits mid. Chains only into s.D, also very fast, great poke overall. st. C: 80 damage, hits mid. A very fast over the head forward swing with her fan. This move has a decent hit box and is the normal of choice against hoppers an hyper hoppers. st. D: 80 damage, hits mid. Mai faces towards the screen leans back and does a sidekick upward at a 20 degree angle, somewhat similar looking to her s.C (close version) If used preemptively, her far D works well against hoppers also. cl. A: 25 damage, chain/cancel-able, hits mid. A quick standing horizontal poke, very fast and is cancel-able and it chain into s.A again or s.B (same as far A). cl. D: 70 damage, cancel-able, hits mid. Mai faces away from the screen leans back and does a sidekick upward at a 35 degree angle. It would seem that s.D has a larger cancel window than s.C.
d. A: 25 damage, chain/cancel-able, hits mid. A standard quick poke to the shins, it still can be blocked high but it has great recovery. d.A --> d.C is a 1-2 frame link. This is chain-able to d.A, s.A, and s.B; it also is cancel-able. d. B: 30 damage, chain-able, hits low. Also a very standard low hitting down B, chains easily to d.A/s.A/s.B. d. C: 70 damage, cancel-able, hits mid. Mai's d.C from the previous years. A very meaty crouch back-elbow attack that is perfect for canceling out of. This move makes Mai crouch down extra low (on a very petite character to begin with) and will duck many high hitting moves if spaced correctly (Terry's Crack Shot etc.). d. D: 80 damage, cancel-able, hits low. Another one of her normals from the older version. A standard sweep, it is cancel-able. j. A: 45(40) damage, cancel-able, hits overhead. Quick poke with her fan angled 45 degrees downwards. It stays out for quite some time so it's a pretty safe bet even for air-to-air battles and it works well air-to-ground and is also cancel-able. j. B: 45(40) damage, cancel-able, hits overhead. Mai leans in and knees forwards, somewhat like Joe's Tiger Kick. Her j.B stays out for a long time, good air-to-ground, crosses up easily, and is cancel-able. j. C: 72(70) damage, cancel-able, hits overhead. A very quick over-the-head forward fan swing (somewhat similar to her s.C) except she's jumping of course, and her body is tucked in. This move is very fast and has real good priority, it cancels, works well air-to-air and air-to-ground (crosses up well also but not as good as j.B). Also, if you hold any direction but up, Mai will perform an air throw. Easily her more versatile jump attack. j. D: 70(68) damage, cancel-able, hits overhead. A very standard, ninja-like (martial arts like) air kick angled 45 degrees. Decent air-to-air (but j.C and j.B is better), great air-to-ground, and it also cancels. This will also be one of Mai's most practical safe jumping tools. CD: 75 damage, whiff/cancel-able, hits mid. Mai spins around real quick and her "tail" whips the opponent. This move possesses pretty impressive range and there is also a short low invincibility period while she is using this move. j. CD: 90(80) damage, cancel-able, hits mid. Somewhat similar to her ground CD, Mai spins around and whips her opponent. It is real fast and has great air-to-air priority and good horizontal hitbox. GCCD: 10 damage, hits mid. Guard Cancel Blowback Attack: Same kick as her close standing D.
Fuusha Kuzushi = Close (b/f+C/D): 100 damage, can be broken, causes a hard knockdown. Mai uses her legs to wrap around the opponent's neck, flips over them and drops them to the ground. After C throw in the corner you can roll for an ambiguous roll setup that crosses up, or roll late to land on the same side each option leads to meaty d. b.
Yura = close in air (b/d/f+C): 125 damage, can't be broken. Mai grabs their body and plants both hands on their torso as if it was a pommel horse and as she "springs over" them she lands her knees onto their body and rides them down to the ground. Wall Jump = (press up forward when near the wall in the air, ub on the 2P side): Mai will jump in the opposite direction of the wall. This move can be used at any area of the wall and is very good for cross-ups, set ups, and getting out of the corner. Ukihane = in air (d+B): Mai does a double knee downwards just like her air throw frames. She flips up slightly before coming downwards. This move has very high priority and has been known to beat certain anti-air special moves. This move is extremely punishable if blocked unless the player uses this move in front of the opponent because it causes a huge push back after they block this move. Ukihane cancels into all versions of her Musasabi no Mai (air qcb+P) as well as Mai's DM and Neo Max. This move is plus frames on block if used as a meaty at lower heights on the opponents wake up. The move is also plus frames if used at lower heights in general - otherwise, this move is unsafe if timed improperly. Kachosen = (qcf+P) : Mai's trademark fan toss. It functions like a typical fireball and the recovery time is minimal. The fan itself causes a huge amount of push back on guard and is a very useful tool for her keep away game and zoning. The A version of Mai's projectile gives decent frame advantage on block; good enough for her to link into st.A or cr.C, adding more combo possibilities. With practice, Mai's damage output will increase quite a bit. This link will work well in the corner. (EX) = qcf+AC - Very fast projectile that cancels out regular projectiles, causes a soft knock down. While this is a very good move to catch opponents off guard with, try to use this move in moderation. Mai has much better options for meter outside of this move. Ryuuenbu = (qcb+P): Mai whips around hitting the opponent with her "tail". It's basically a flaming version of her s.CD with a rather large hitbox. The A version is faster but C version hits twice if close enough. Canceling off the first hit sets up juggle opportunities in the corner. Both versions are safe, however the A version has even less recovery than the C version does. This special move also builds meter if Mai whiffs it. The C version of Ryuuenbu will occasionally whiff opponents at certain spaces when it is canceled from heavy normal moves, so in a lot of cases, Mai is better off canceling into the A version of this move. Also, the C version CAN be punished if she is far too close to the opponent (though it is still very difficult to do so - DO NOT OVER RELY ON THE C VERSION OF THIS MOVE). The A version of Ryuuenbu offers a slightly better edge for Mai to continue her offense, especially while she is close to the opponent. (EX) = qcb+AC - Juggles and can easily lead to big damage, especially in the corner. This move can be followed up with her Hissatsu Shinobi Baichi (HCK+K) or C version Kachosen (her projectile). This move will leave Mai at +7 frame advantage on block, so the player can utilize this for frame traps and continuing their momentum. This is generally one of Mai's best combo starters. Hissatsu Shinobi Baichi = (hcf+K): D version hits 3 times on crouching opponents and 2 times on a standing opponent. B version hits 2 times and travels a short distance. This move is good for closing the gap and applying pressure, but is not safe on guard. Mai can also be thrown out of this move before she uses this but this does not occur often sense Mai should be using this to cover distance for hitting the opponent and in combos. This special move also builds meter, even if it whiffs. While it is possible to utilize this as an anti-air, it is not recommended and can place Mai in a rather dangerous situation, even if she hits the opponent out of the air. It is best to use this during combos. Do not simply throw this move out randomly because it is extremely unsafe. What needs to be noted is that this move can actually be used as an anti-air to advert some cross up attempts or obvious jump ins (like Takuma's j.CD attack). It is still best to use this move in moderation. (EX) = hcf+BD - A faster and safer version of the Hissatsu Shinobi Baichi. Leads to huge damage if you use a drive cancel in the corner or do a follow up after the move so that drive meter is saved for another cause. The EX version hits 5 times and is safe against everything but 1 frame grabs. The last hit of this move will put the opponent into a juggle state. Can be a very useful move, especially in the corner and as a combo starter. Musasabi No Mai = (c.d~u+P): Sends Mai shooting upwards into the air. This move is extremely trustworthy for getting across the stage easily and for playing better keep away. The player will need to press up in the direction Mai needs to go. Mai will jump extremely high and quickly. This move can followed up with her air d.B Ukihane command move anytime during the moves animation, unless she touches the wall. If the players holds the P button after reaching a wall, Mai will do her diving Musasabi no Mai, but if the player does not hold on to P, she falls back down on the ground. What needs to be understood is that Mai is still vulnerable to normals and anti-airs during the jump animation so the timing of this move plays a pivotal role in her mobility. Mai can also use this as a wake-up option to get out of common frame traps, especially in the corner. Last, this can be used a safe jumping tool from longer distances as well, because the opponent will not be able to whiff punish her on landing and she can jump immediately after landing back on the ground to avert command throws. Musasabi No Mai (Air) = (qcb+P) in air: Mai dives to the ground head first. Juggles the opponent. Generally a very unsafe move if blocked. It is possible to make it a little "safer" by aiming towards the lower part of the opponents sprites to produce a little more push back so that it can be more difficult to punish. Use this move in moderation (i.e. punishing badly timed projectiles, mix ups towards grounded opponents, starting combos, etc). Keep in mind that Mai is neutral on block if she uses this instantly in the air close to the ground next to the opponent. At the lowest height, this move is relatively safe, unless the opponent has a 1 frame command grab. (EX) = qcb+AC in air - A lot safer than the regular version, still has juggle properties, and hits three times. Mai is 0 frames on block and she can use this as an offensive maneuver, as well as conducting her mix ups in the air. Mai performs this version of Musasabi no Mai off of a wall jump against a cornered opponent, Mai will get the opponent four times instead three, thus giving her more frame trapping opportunities and a bigger window to combo for better damage. When this version is used at the top off of a wall jump towards a cornered opponent, Mai will get four hits instead of the usual three hits. Very good for corner pressure. Another trademark move for Mai. Her whole body engulfs in flame as she does the cartwheel forward into the leaning elbow just like her hcf+K. This move sadly has a low priority considering it being a DM. The EX version is better and quicker but due to the forward motion, if the opponent is right above you the EX DM will miss them completely so it is unwise to use as an anti-air. Her air version is returns after last being in '95 under a hidden movelist, not the best priority, use sparingly. (EX) = qcb hcf+BD - can be done in the air and has invincibility in the start-up. You can also link an air throw or use a normal to reset your opponent in the corner. In fact, it is actually possible to combo after the EXDM from the air version but the timing is tight and the opponent would usually either have to already be in mid air before the EXDM or they are on the ground taking damage from the air version of the EXDM. A very useful combo extension tool if the players can get the timing correct. Kunoichi no Mai = (qcf hcb+AC) also in air: Mai does Musasabi No Mai and springs quickly to the wall and quickly dives towards the opponent. Reports indicate her dive is just short of fullscreen. This move is relatively quick and will connect if say the opponent is hit by her qcf+P. Mai can use this under many circumstances such a finishing any HD combo, 2 frame punishment for jumps of any kind, counteracting laggy moves or a characters attack on reaction, and beating out projectiles. This is one of the few Neo Max's in the game that can be used raw. Another thing to note that it is a very great combo ender as damage scaling can be adverted to a degree sense it has very few hits. If her dive connects, she'll proceed to dive in multiple directions (Mai actually spells out a Chinese/Kanji character) finally landing, does a pose point to the screen with her fan and the opponent explodes leaving the kanji "woman" (onna) burning in flames. (4) [corner] j.C., s.D [HD] s.D, hcf D [2 hits], [HDC] air.qcb C, hcf D [2 hits], [HDC] qcb C, qcb C, qcb C [1 hit] [HDC] qcf A, qcb C, qcb C [first hit], Neo Max =  [NOTE: If Mai activates HD and does far standing D, the damage becomes 810 damage instead]. 1.) cl. A > cl. C - 3 frame gap between cl. A, and cl. C. 2.) cl. A > cr. C - 3 frame gap between cl. A, and cr. C. 3.) cr. A > cl. C (L) - 2 frame gap between cr. A, and cl. C. 4.) cr. A > cr. C (L) - 2 frame gap between cr. A, and cr. C. 5.) st. B > cl. A - 3 frame gap between st. B, and cl. A. 6.) st. B > cl. C - 4 frame gap between st. B, and cl. C. 7.) st. B > cr. C - 4 frame gap between st. B, and cr. C. 8.) cr. B > cl. C - 4 frame gap between cr. B, and cl. C. 9.) cr. B > cr. C - 4 frame gap between cr. B, and cr. C. 10.) Instant/ lowest air qcb+A/C > cl. A - 3 frame gap between instant/ lowest air qcb+A/C and cl. A. 11.) Instant/ lowest air qcb+A/C > cr. B - 4 frame gap between instant/ lowest air qcb+A/C and cr. B. 12.) Instant/ lowest air qcb+A/C > cl. C - 4 frame gap between instant/ lowest air qcb+A/C and cl. C. 13.) Instant/ lowest air qcb+A/C > cr. C - 4 frame gap between instant/ lowest air qcb+A/C and cr. C. 14.) qcb+AC > far A - -3 frame gap between qcb+AC, and far A. 15.) qcb+AC > cr. A - -2 frame gap between qcb+AC, and cr. A. 16.) qcb+AC > st. B - -1 frame gap between qcb+AC, and st. B. 17.) qcb+AC > cr. B - -3 frame gap between qcb+AC, and cr. B. 18.) qcb+AC > far C - 1 frame gap between qcb+AC, and far C. 19.) qcb+AC > cr. C - -3 frame gap between qcb+AC, and cr. C. 20.) qcb+AC > cr. D - 0 frame gap between qcb+AC, and cr. D. 21.) Corner qcb+AC > cl. A - -4 frame gap between corner qcb+AC, and cl. A. 22.) Corner qcb+AC > cl. C - -3 frame gap between corner qcb+AC, and cl. C. 23.) Corner qcb+AC > cl. D - 0 frame gap between corner qcb+AC, and cl. D. 24.) Air qcb+AC > cl. A - 3 frame gap between instant/ lowest air qcb+AC and cl. A. 25.) Air qcb+AC > cr. B - 4 frame gap between instant/ lowest air qcb+AC and cr. B. 26.) Air qcb+AC > cl. C - 4 frame gap between instant/ lowest air qcb+AC and cl. C. 27.) Air qcb+AC > cr. C - 4 frame gap between instant/ lowest air qcb+AC and cr. C.
Mai does okay in this range as she does have plenty options. Should Mai possess meter, she can punish jumps, laggy moves, projectiles with her own Neo Max for 2 frames. It is also easy for Mai to zone with her Kachosen and she can use her normal moves to play more keep away. If the opponent gets too close, Mai keep the opponent out with CD and whiff cancel that into qcf+A (Kachosen). At this distance, Mai can take the time to build meter with her A version Ryuuenbu. Both her Ryuuenbu and her own projectile can negate non-EX projectiles. To close the gap between you and the opponent, Mai can use her ground Musasabi no Mai (d charge u) to jump quickly towards the opponent - when she does this, Mai can use her mix ups from their with her j.d.B command move Ukihane or use a diving attack if she near a wall. If the player still wants to keep space, they will have to take advantage of her speed and her Musasabi no Mai to turtle or play more keep away to win the match. Kachosen (qcf+A or C) > if the opponent tries to jump in on you, Mai will have to block and punish (or throw) whenever possible. In good timing, Mai can also punish jump ins with st.C, jump CD, A version Ryuuenbu. Mai works best in this range. If Mai is nearest to a corner it is possible to beat out a few of the opponents jump ins by wall jumping then using j.D, j.C, or air Musasabi no Mai (air qcb+A or EX qcb+P). If the opponent goes underneath you, Mai can use her air d.B instead and cancel that into a air Musasabi no Mai (or the EX version to make it much safer on guard). Mai can poke the opponent out with st.A and cr.A and she can cancel her cr.A in a few of her special moves after a hit confirm. Mai can also set up her mix ups at this range too, especially if she does corner the opponent. Mai can also employ her ability zone, rush down, or play more keep away. To keep space, Mai can make use of her projectile, Ryuuenbu, CD attack, jumping CD, and her normal moves. Mai can also super cancel into her DM's from her projectile as well. When Mai is mid range from her opponent, she tends to do pretty well against zoners and more defensive characters. Standing C and standing FAR D good for anti-airs and stopping hops and rush down characters. Stand C has a wider hit box, while s.D has a longer horizontal hit box. Mai can cancel her back dash into her air Musasabi no Mai (air QCB+P or the EX version of it) or her DM series. Mai can super cancel out from her Kachosen projectile into her DM in case her opponent decides to jump in. Mai also works very well in this range if the player is cautious of their match up at close range. It is relatively easy to apply a very high functional rush down game. Mai can poke safely with her st.A as it leaves her at a frame advantage and possesses decent priority. Mai's cr.Bx2 to the st.B, st.D target combo is a very safe block string that can also be used as a easy hit confirm into an HD combo. Mai also has a fast CD attack with a generous horizontal range which allows her to whiff cancel into her special moves. Mai can capitalize if the blocks, gets hit, or counter hit. On a counter hit, Mai can follow up with an air throw, a Kachosen (qcf+A/C), a A version Ryuuenbu to an air throw, or even a good corner combo for more damage. Another things that should be understood is that Mai can whiff cancel her cr.D into special moves as well. Mai's cr.D is not particularly safe on guard (in spite of its push back on guard) but it is easy to whiff punish. For instant overhead, Mai can resort to hopping j.A, j.C, or j.D. Mai's j.B is a very good tool for crossing the opponent up. Mai can also cancel her j.B and j.D into her Ukihane which in turn can be cancelled into her air Musasabi (air qcb+A or C). Keep in mind that Mai moves extremely fast in general, so she can take very good advantage of option select throws/throw techs and keep applying pressure on to the opponent. To ensure safety on drawing Mai in for offense up close is to time her jump ins/ground Musasabi no Mai appropriately. Mai's j.A has very good range and hit box on the way down from her jump and doubles as a good method of utilize a meaties while adverting the opponent use of any invincibility reversal. Ryuuenbu (the A version) is a trust worthy and safe method of applying pressure so the player is going to using this a lot. The C Ryuuenbu should be utilized for combo as the recovery is a tad bit slower than the A version. Both versions can also be a good anti-air tools when timed appropriately. Mai can also make use of her EX DM to dish out a good reversal if she is on the defensive in close combat. Mai has a very fast CD attack both in the air and on the ground, which can whiff cancel into any of her special move. After d.B, d.A hit confirms are blocked the player can perform d.C and then immediately cancel into ground Musasabi (d.A and d.C cancel into special moves) and then immediately press (air d.B) for an overhead mix up. This is nearly impossible to react to and Mai is nearly guaranteed to get a hard knockdown on this particular mix up. This is where Mai turns into a complete monster. Mai is at her best here because this is where her most damaging combos stem from. Mai + meter + corner = complete disaster. The reason behind this is because all of her EX moves cause the opponent to enter a juggle state. With so much as one stock, Mai can dish a serious amount of damage. Most of her combo enders will be a reset or her air throw. Mai can use continue her aggressive mix ups from there after a reset and she benefits very well from landing hard knock downs on the opponent. Again, Mai benefit well from hard knockdown and super meter. If you can not get your opponent to the corner, the player will have to zone them out until that end up in that situation. At further range Mai can shred the opponents health meter gradually or she can zone them into the corner and do a massive amounts of damage should that option become available. The corner is where Mai can work her magic. Lot of mix ups and safe jump set ups. Mai can use CD attack on the opponents wake up for counter hits > C qcb+P > air throw. Mai can wall jump after the opponents knockdown or if they attempt a reversal then she can cross them up once more with air d.B, j.D, j.B, and J.C.
Mai cross the opponent up after conducting a corner throw (roll or jump to the other side immediately after throwing the opponent into the corner). Utilize Ukihane to counteract DP/anti-air attempts but do this as soon as possible, otherwise it will result in a hit trade. Mai's EX air qcb+P has invincibility properties so use this after a Ukihane. Mai can establish her most damaging combo from this scenario if she corners her opponent. Many of Mai special moves will also drive the opponent into the corner after successful hits. Be on the look out for moves with high invincibility or priorities. Mai will have a much easier time conducting her d.Bx2 into j.C or ground Musasabi > j.d.B > qcb+A/EX qcb.AC mix ups. In HD mode, Mai can also have a lot more block strings and frame trapping tools available. Mai will be at a disadvantage in this situation. Mai does not have a anti-air and she lacks any sort of reversal without her meter. Mai can push her opponent away with c.Bx2, s.B, s.D combo. Mai will have to Guard Cancel Roll/Blow Back the opponent to get out of her bad situation. Mai can still use her BnB's in this scenario and she can stop jump ins with her s.C. Mai can also wall jump from the opponent at the full height of jump sense most characters super jumps will not reach that far up. Mai can also apply her basic close range pressure with her CD > Kachosen. Knowing when to roll out of the corner is a good idea, but rolling leaves the character vulnerable for a moment after the animation. Mai can roll out of the corner to avoid laggy moves or unsafe pressure. Last, Mai can use her Musasabi no Mai to jump out of the corner. Mai can cancel the jump animation into her command move because it a lot of priority over many air normals and several anti-airs, if the Musasabi jump should be interrupted. Another good tool for her to use to get out of the corner is her wall jump if the opponent is hopping too much or if they are on the ground for too long while they are trying to apply pressure. She can get out of the bad situation by crossing them up with air d.B after a wall jump or by simply wall jumping away from the corner so that she can apply her own corner pressure accordingly. Push the opponent away with s.B and s.D target combo. Use d charge u Musasabi no Mai (forward) to jump quickly out of the corner after pushing your opponent away with CD > Kachosen or s.B > s.D target combo. After a wall jump you can use Ukihane (air d.B) to cross the opponent up or simply jump away to the other side of your opponent. Tick throw your opponent into the corner if possible - Mai can corner cross-up from there too. Mai does not do much damage outside of combo links and super meter. However, Mai gives the player a great opportunity to play keep away. Keep away is very important for someone like Mai because of her normals, her j.CD, her Musasabi no Mai (both air and ground versions), her wall jumping, and her projectiles. Without meter, Mai is not capable of doing much damage, so she will have to resort to meter building, some basic rush down, and/or keep away tactics. Mai can build meter off of Hissatsu Shinobi Bachi and Ryuenbuu. It is still possible for Mai to be annoying if the player understand how her unique jumping arcs work, as well as her normal. Stand C and D are great for anti-air purposes. If the opponent tries to get too close to you and you are trying to get away, jump backwards, CD attack. Use j.C and press forward if in case the opponent tries to jump in. A preemptive j.D or j.CD attack will beat out a lot of the characters normals, including things like Duo's j.CD or Kyo's j.d.C command move. Ukihane also has a lot priority in the air guarantees a hard knockdown on hit. cr.Bx2 > s.B, s.D target combo for push. After CD > Kachosen, Mai can quickly run towards them to bait a reversal or to utilize her s.B, s.D for guard break damage and to push the opponent into the corner some more. Her BnB's and punish combos will work well under any circumstance and they will work much better in the corner. Air Musasabi no Mai (air qcb+A) is slightly safer than air qcb+C. Use Musasabi no Mai (ground version) to travel longer distance to punish fire ball use, keep away, or hops/jump ins. With so much as one super meter, Mai becomes dangerous. Mai can expend one meter on her EX Kachosen to crush other regular projectiles in a fire ball war or to catch opponents off guard. Her EX Kachosen also sets up a juggle state on hit, so it is possible to follow up. In fact, all of Mai's EX special moves causes a juggle state. A corner opponent in a juggle state means Mai can capitalize here with Ryuenbuu loops. Most of her combo finishers should consist of an air throw to get a hard knock down. Mai benefits perfectly well from hard knock down, especially in the corner, sense she is given even more options there. All of Mai's EX moves set up a juggle state, but EX hcf+K and EX air qcb+P are extremely trustworthy. EX Ryuenbuu (EX qcb+P) is a very good punish tool and can lead into more damaging attacks for a good combo. If an opponent intends to catch you off guard with a Neo Max are powerful attack air EX Musasabi no Mai can save you. For example, EX Musasabi no Mai will go right through Mature's raw Neo Max. It is possible for Mai to perform a good reversal with EX Ryuenbuu or EX hcf+K - otherwise guard or roll on wake up then capitalize with an attack or defensive maneuver. Utilize DM for punish combos, combo finishers, or to beat air to air attacks. Even with just drive meter, it is still possible for Mai to work her way to victory. Mai can resort to corner combos such as st.C, hcf D, [drive cancel] > qcb C. Mai can easily go for super cancels with any of her specials as well. If Mai conducts that same combo with 100% drive meter, she can continue her combo from qcb C and drive that into qcf A, and then finish the combo with qcb C and then a air throw. The drive meter can help Mai can get much between punish combos without meter. Mai can also drive cancel her hcf D into her air qcb C and then perform st.C for a reset and then continue her mix ups in the corner. Last, if Mai has 100% drive meter, she can still her damaging HD combos with very easy hit confirms (cr.B, st.B, st.D target > HD activation). If Mai corners hurt opponent, she can net over 600 damage for meter. It is also important to note that if she is not using HD combo and she resorting to drive cancels, she can build a huge amount of meter. With one meter, Mai can play a lot more mind games and net some better damage off of her combos too. Mai can do a lot of damage with just one meter alone, and things will begin to look bright for her with drive meter. Mai can super cancel all of her moves. If she confirms any of her special moves, she can easily super cancel into her DM. She also has very good EX moves, all of which can set juggle states to start a combo. Mai's ability block punish/whiff punish also becomes more proficient. Mai can do combos such as st.C, hcf D [drive cancel] EX qcb AC, hcf D combo ender. If she is in the corner conducting a combo like this she can for st.C, hcf D [drive cancel] EX qcb AC, qcb C, and then Air Throw. This is just from 50% drive. With 100% drive, Mai can extend her combo with another EX qcb AC after two qcb C loops to continue a juggle. Mai can easily net 400/500 damage with corner juggle combos with one meter and drive meter. With HD combos, Mai can still net over 600 damage and finish a round quickly if she drives the opponent into the corner. What needs to be understood is that Mai can easily wall carry her ability from the middle stage with 50% and 100% drive. The damage output for Mai increases exponentially with one stock and especially 50% and 100% drive meter. Mai also has a better defensive options with meter. Mai can cancel her cr.A and cr.C into different special moves. After cr.B, cr.A Mai can cancel her cr.A into her ground Musasabi (d charge u+P) and then cancel into j.d.B Ukihane. If the Ukihane connects with the opponent, Mai can cancel into air qcb+A or EX air qcb+P. Ukihane into qcb+A or it's EX version is not a natural block string. From a complete full screen, if Mai super cancels her qcf+A projectile into her EX DM specifically and connects with the opponent into the corner, Mai can follow up with another full combo (the Kachosen will hit the opponent AFTER the EX DM causing the opponent to reel upwards for a follow up or reset). Also from a complete full screen, Mai can use her projectile to bait the opponent into a jump and then she can jump in her EX DM or EX air qcb+AC as a air to air. Mai can corner cross up from throwing the opponent into the corner. After a corner throw, she can either roll onto the other side of the opponent or she can simply jump over them and still end up on the other side. This applies to both corners on the field. Ground Musasabi no Mai (while holding a punch button) can be used as a cross up tool as well against opponents that are nearby the corner. Mai can even use Ukihane after she touches the wall from ground Musasabi no Mai. Mai can use her EX hcf+AC as a frame trapping tools as there is one more hit that leads into a juggle when she just as she lands from performing that move. Always keep in mind that Mai can change the trajectory of her jumps using Ukihane, air qcb+P, EX air qcb+P, DM, EX DM, and by wall jumping. Use these to bait out unsafe reversals and punish carefully. When the opponent is knocked down, take advantage and hop over the opponent and use j.d.B to cross the opponent up. You can also use Mai's Ukihane as a safe jumping tools - she can then hop C (to counter command throws) tech throws, or block the opponents attacks (i.e. DP/Flash Kick reversals). Point: Mai can do well with just three meters (it would only take one drive guage to produce 381 damage with this: (corner combo) s.C, hcf+K (2hits), [DC] air.qcb+C, qcb+C, air throw. She can also net over 655 damage for a meter less HD combo. Mai can be a solid point character, but the player needs to understand how to move around and use her normal moves to annoy the opponent. The air throw is a practical tool for catching opponents in mid-air and Mai is known for having very good priority in her attacks. Don't hesitate to utilize j.A and air throws as an air to air against your opponent. Mai's j.A can definitely beat a lot of normal moves from mid air. Although, Mai does have the potential to play a powerful keep away game and the tools to do a lot of short term combos, this position is not recommended for tournament game play unless it for match ups where other characters might do so well at mid or far screen (i.e. Kyo or Kim for example). Mai's meter-less combos are not too damaging, but if the player understands how to use her normal moves wisely and build meter, she can be rather annoying. When starting the match with a meterless Mai, the player is going to have make very careful use of her normal moves, great mobility, zoning, keep away, and her mix up game. Mai works exceedingly well in this position. In fact, this is Mai's best position specifically in high level tournament game play. With four stock meters and a full HD guage, she is extremely dangerous. Mai's normal moves are powerful enough to annoy and damage the opponent gradually, she builds meter relatively easy from qcb+A or C, and she can operate very well at mid screen. Mai's Neo Max is another factor that can change the game plan altogether. The reason why Mai does so well as a battery is because she has very nice set of high priority normal moves and many tools at her disposal for out-zoning the opponent. Another thing to consider that her reversal options reveal themselves when she has meter and all of her EX Moves causes the opponent to enter a juggle state. Using her basic BnB's will help her carry opponents towards the corner. This is Mai's best position and she can play under a variety of conditions and situations, such as providing rush down, corner pressure, turtle, and zoning. It is possible for Mai to be a good utility character as well, as she builds meter off of her Ryuuenbuu and her HCF+B or D moves. In this position, Mai can practically do whatever she wants if the player carefully establishes use of her normal moves, safe jumps, and mix ups. The first character before Mai will have to have good meter building for Mai to reek the benefits and conduct her game play as planned (things like EX Kyo, Ralf, or Kula come to mind for point characters). Her damage output and defensive options become extremely potent as long as she has meter. Mai arguably plays the same role as she did in the second position. Mai is still a fearsome opponent to face, even in this position because she would likely to have meter by the time the secondary character is defeated. Knowing how to dominate in the air with Mai, as well as the nature of her normal moves will factor into the her ability to win. This reinforces her ability to make some impressive comebacks without too much difficulty and she does have a few good match ups against some of the better anchors due to her ability to play keep away and her ability to move around the stage easily. Mai does actually have decent comeback potential because of her speed, keep away, pokes, and how well she benefits from meter, but the player needs to be extra careful and play very cautiously with Mai. Even though, she does very well in this team position as well, this position is still not recommended, unless it is for specific match ups. Should an individual plan on playing Mai as an anchor character, the play should manage their meter carefully. Play a functional keep away game against Andy. Mai has better zoning capabilities due to having better mobility and slightly better normals. Mai's air command move d.B Ukihane can beat both versions of Andy's DP if she is right on top of his head or if it is cross-up. All versions of Andy's Zanei ken is punished by Mai's Kachosen. A well timed Hisobi Baichi can beat out the Zaneiken as well. After Zanei Ken, Mai can punish Andy with EX Ryuenbuu, s.B, d.D, her EX DM, or Neo Max. Multiple normals and Mai's projectile can beat out Andy's Zaneiken. Use Mai's C/D attack to provide more distance - it can be whiff cancelled into all of her special move and can cause all of block stun and push back. This match up is in Mai's favor if she stays at mid range consistently. Mai can easily punish Ash when his projectiles are poorly timed. Don't bother getting into projectile wars. Just wall kick or use Ground Musasabi no Mai to punish when Ash is still throwing projectiles. EX Kachosen can cause Ash problems, especially when he does not have any meter. Never let Ash corner you - Ash can create powerful HD combos and Sans-Coulette combos from the corner, much like how Mai can conduct her own damaging HD combo. Mai should be the one applying pressure. If Ash tries to rush down, poke him out with her normal and apply careful offense to turn the tide. Ash's normal have shorter range compared to Mai and she can bait Ash's somersault anti-air. Do not jump around too much if Ash has 2 super bars. Annoy Ash with well timed attacks and ground based offense when applicable. Mai is at a slight disadvantage in this match up - Athena has a better ability to zone and has a good air C/D attack. Athena is weak to corner pressure however, so Mai will have to implement a cautious offensive game - keep a short distance between Mai herself and Athena (Like a two character length). Athena also has several mid-air options like Mai does, but is vulnerable to air throw and the air Musasabi no Mai beats out Athena's Phoenix Arrow. EX Musasabi no Mai and the EX Phoenix Arrow is a hit trade. Mai's air d.B Ukihane and Athena's Phoenix Arrow will always trade. Athena becomes extremely weak in the corner and the corner is where Mai can use her most deadly combos. Athena's Psycho Reflector can be used as a anti-air tool as well, so put a little more emphasis on punishes and cross ups. Push Athena into the corner carefully with Mai's normal moves. Athena tends to gradually weaken in the corner and her combo opportunities will become limited. Athena can jump a further distance than Mai can. Most of Athena's jump in's can be counteracted by a Ryuenbuu or s.C.
Use Mai's Kachosen sparingly - All versions of Athena's Psycho Reflect can reflect all of Mai's projectiles. Including the EX Kachosen. can punish this with dash up st.B (tight timing), EX qcf+P, EX hcf+K, DM/EXDM, or Neo Max. Do not pretend like Beni is plus frames on everything he is does. Beni has several options in mid-air much like Mai does, so stay cautious when jumping. Beni also has more than a few anti-air tools as well. If Beni jumps from a far range, use qcb+A or EX DM to counteract his far jump ins. Beni jumps very high and very far so time your rolls carefully. Mai's air EX qcb+K works very well in this match up as well. Mai can make use of her projectile here too, but keep in mind that Beni gets long range options when he has meter. Try to stay on the move and don't stay in one place. Watch out for Beni EX qcb+K. That can be blocked and rolled away from. Mai can also avoid this move by simply running towards him. Don't rely on jump-ins too much, because Beni can resort to DP+B which gives him push back to make it a little more safer. He also has qcf+A, his DM, and that can also be used as a anti-air. Don't let Beni corner you. Mai needs to stay at mid range when fighting Beni as well, because he also has a command grab. Hopping j.C, Hop j.A, qcb+P (both versions), and Mai's CD attacks work extremely well in this match up. Mai's CD attack and qcb+A give Mai low invincibility so this can stop Beni's hit confirms. Mai's normal moves have a little more range and she can use her normal moves and projectile to zone Beni. Stay cautious when Beni gets meter always stay mid range from him. Keep your distance. Billy Kane works extremely well up close and has very good command moves. To counteract Billy f+A, st.C would work very well, because his f+A has a little start up. GC Blowbacks also work here. Zone Billy out with qcf+A and C and stay at mid range. Stay away from the corner. Try to avoid jump too much because Billy has plenty of good anti-airs to counter act them. Resort to hopping normal moves instead. To put Billy at a disadvantage, Mai needs to be the one cornering him. His regular DP is a bit on the slow side and can easy safe jumped and punished. Use j.d.B Ukihane to change your jumps to avoid anti-airs altogether to start Mai's mix ups and whiff punishes. Mai's EX DM can out prioritize many of Billy's specials when she is at mid or close range. Play a functional rush down game but be cautious when Chin has meter. Do not let Chin drink, because it can spell danger. Stay mid range but don't let get too close or too far away. Chin also gets weak in the corner so Mai needs to focus a little more on offense. Chin is basically a master of the ground, while as Mai plays the same role in the air. Use the air (j.d.B, air qcb+A or C, EX qcb+AC, Wall jumps, j.CD, j.A, and j.C) to your advantage. Chin does not have much of an advantage in the air and he does not jump as high. Mai generally has a good advantage of Chin in mid air. Try to stay close to Chin and conduct a functional poking, mix up, and keep away game, but don't ever let him drink. Mai can provide her mix up game by use pokes and hopping normal moves. Mai's hopping j.CD can help, especially if Chin is in the corner. Don't let Chin corner you. If he does, GC Roll out of the corner when he starts his block strings and mix ups. Wall jumping and then mixing up with Ukihane > air qcb+A can be a big help, especially for getting out of the corner and building up Mai's offense. Zone Clark out. But, use discretion when Clark has meter because his EX b charge f move can go through projectiles and is somewhat safe. Maintain distance between yourself and Clark. Clark does not function well from longer ranges, which is where Mai shines. If Clark does corner you, resort to j.C and wall jumps to avoid grab set ups. qcb+A, st.C, st.D, j.A, or j.D to interrupt is momentum. Try to neutral or jump backwards while utilizing the jump moves because they have a very decent hit box on them. Mai has a much better options in mid air than Clark does. Air qcb+P and Ukihane can work well if you anticipate on Clark jumping. When you are at mid or far range, use qcf+P (moderate between both projectiles) and zone him out. Force Clark into making a mistake and punish. Mai has very little recovery on her projectiles so be prepared to counter act if you are at a further range. Play a functional rush down game against Duo Lon. Stay relatively close to him but stay out of range of his hit confirms. Duo does have any true anti-air's outside of cr.C. Duo's EX teleport can go right through everything so Mai needs to be careful. Duo also has a lot of good frame traps and zoning tools, do not stay in the corner for too long, and make sure Mai stays on the move and conduct her own mix-ups and rush down. Don't rely too much on projectiles. Duo Lon can counteract them with f.B, f.A, his EX teleport, and his own projectile. Don't let Duo Lon pressure you at all. It needs to be the other way around. Elisabeth does not have any real long range options outside of two meters. Mai can resort to using many of her options in mid air, such as air j.d.B Ukihane. Elisabeth's anti-air options are poor in general outside of her qcf+A. Elisabeth's strengths are on the ground. If Elisabeth gets close to you, Mai's hopping j.C, her ground CD attack, st.A, and her EX moves can distort Elisabeth offensive all together. Don't get too reckless with Mai's offense either, because Elisabeth has qcb+A and qcb+C which can guard lows and high/mid moves respectively and charge her positioning. Mix up your attacks and go for whiff punishes on Elisabeth. There is also invincibility on Elisabeth DM's so conduct a cautious rush down game while staying close to the ground and resorting safe jumps and hopping normal moves. Be careful about projectiles at the mid range. Elisabeth's DP+C can go right through them. Time them so that the Elisabeth play can not react correctly. Stay mid range or far range from Daimon. Daimon has very good priority on his air normal moves but they are a tad bit slow. Use Mai's j.A to interrupt Daimon's normal. Never let Daimon get close to you. If he does, use hopping j.C or j.D to stop grapple attempts. You can cancel j.D into Ukihane as well. Ukihane can cancel into Mai's air qcb+P (or EX a qcb+P) as well in case the Daimon manages to block the attack. If you're going to zone Daimon out, use Mai's qcf+P projectile and change the versions up periodically. Daimon does not have many long range options except for his Earthquake move. If you anticipate this, jump and get ready rush down and conduct a functional mix up. Daimon Earthquake move has a slow start up, so EX qcf+A can keep Daimon honest. If Daimon is cornered, carefully utilize poke and stay a one character distance. If Daimon is jumping, you can try for j.A or j.C (option select Air Throw) when you are at that distance. Keep in mind that Daimon is a very big target. Hwa can get zoned out easily if he does not have meter and he isn't drunk. When Hwa has at least one meter, stay a two stay at least character length away from him. Keep in mind that Hwa has a DM that functions as a command grab. Don't focus too much on projectiles if he has meter or if he is drunk either because his DM can go through projectiles. Only do so if you are at a full screen distance. If Hwa rolls or jumps, you can punish him. Mai can change the pace of the fight between herself and Hwa if she is at a full screen. Hwa has many options in mid-air all of which are dangerous. Mai is in mid air, she can go for j.A, j.CD, air EX qcb+P, and her EX DM to beat out any of Hwa's air to air moves. Back dash a bit more to avoid getting comboed off of normal (normals that contact opponents in mid air cause air reset). Hwa has a high jumping arc, even on his hops. Mai's normals will work extremely well in this category. This match up is in Mai's favor. Mai can zone out Claw Iori easily but be warned - a Claw Iori with meter is extremely dangerous. All of Claw Iori EX moves except for his command grab, have invincibility start-up and he is combo-friendly. Play a offensively but stay cautious. Claw Iori's st.C functions as a good anti-air, so don't perform too much jump ins from longer ranges. Mai has an advantage of Claw Iori because of her high priority normals and pokes. EX Kachosen can counteract any Claw Iori EX special moves (EX Iori's EX qcb+K goes through normal projectiles on it's start up. EX Iori's EX Super also goes through projectiles). Iori's d.D is extremely punishable on even block. It also have a very huge amount of whiff recovery, so if you anticipate this move, use jumping normal to counteract. Iori has a auto-cross up (Taco) as a command move. If you anticipate this, roll out of range, and don't roll right next to him. Mai needs to keep short distance away from Iori. Keep in mind that qcb+B is relatively safe by can be punished by jumping normal as he does the move. He also has a command throw so quickly get out of range and zone him out if he tries to get too close. Mai also moves much faster and has multiple advantages in mid-air against Claw Iori. EX Iori's qcb+C (C rekka) travels deceivingly far, but it is not safe. Don't get too predictable at mid range, because it is possible for Iori to punish in that range. Focus on careful hops for Mai, rather than super jumping or regular jumps. That way, you can guard on reaction if you see Iori's attacks coming. Mai has an advantage in mid air and at further ranges. Mai's normal moves to keep EX Iori honest. Much like Claw Iori, EX Iori is also a bit slower than Mai. Use Mai's speed to her advantage. If Iori is in mid-air, look out for his j.D. Block safely, and space yourself so that you can go for block/whiff punishes. st.C is a viable anti-air for Iori so do not focus too much on direct jump ins from mid ranges unless it is to punish his Yami Barai (qcf+A or C). EX Iori has a legitimate anti-air, so time your jump in carefully. If Iori is going to zone Mai out, she resort to ground Musasabi no Mai (d charge u+P) and punish him from longer distance by cancelling Musasabi into Ukihane for a hard knockdown. She can then go for a meaty j.C or CD attack on EX Iori's wake up. 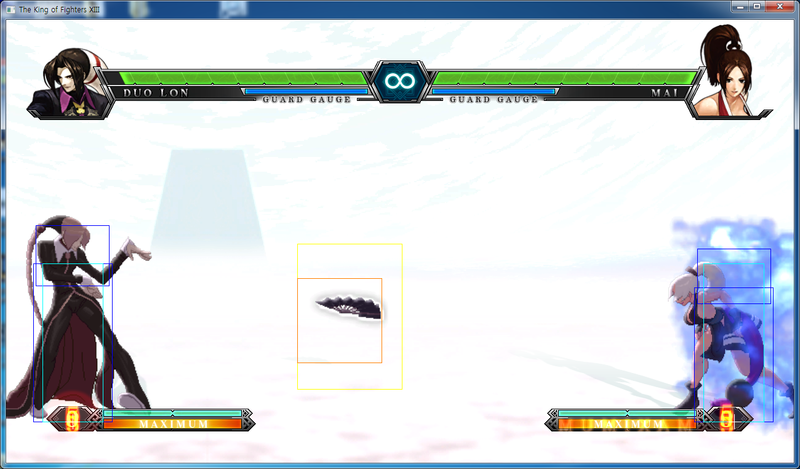 EX Iori's EX qcf,hcb+P DM DOES NOT have invincibility start up like Claw Iori's version does. Most of EX Iori's special moves are punishable, so stay mid range, and guard them appropriately. Mai's reversal and ability to counteract gets better when she has meter, so resort to safe special moves (qcb+P, qcf+C) and her normal keep EX Iori at bay. Don't use too many jump-ins because a simple st.C from Iori can smack Mai out of the air. Go for a cross-up Ukihane instead. When you corner Iori, conduct a cautious rush down game. Stay one character length away from EX Iori, because he has command grabs. One that require meter and the other which can be done without. The first two hits of Iori's rekka are easily punished by Mai's cr.C. If Iori attempt to conduct rekka's and if Mai blocks them she can punish with cr.C, A Ryuenbuu. If the Iori player decides to finish the rekka, Mai can ust interrupt the third hit with st.A or she can block and punish. Pay close attention to what is going on. This match is mostly even. Joe's strength and ability are mostly ground based, while Mai does better in the air. Mai has a slight advantage over Joe in terms of normal moves and pokes. Be careful about Mai's jump-in's and hops. Joe has a LOAD of invincibility on his DP+K. However, neither version of the move is safe on guard and Mai can easily safe jump and punish him directly. Mai can do very well in this fight at any range, but when Joe has meter, she will have to put more emphasis on safe jumps and using the air to her advantage. She can change the trajectory of her jump with j.d.B and she also use this as a pressure tools and cross up. If Joe is at far range with meter, he is likely to use meter for this EX qcf A Hurricane Upper. Mai can use Musasabi (d charge uf+P) to negate projectile wars all together and punish appropriately. K's qcb B or D and his follow up are not safe on guard, so Mai can easily punish from there. Mai can go for EX qcf AC to defeat any zoning attempts from K', because of his unorthodox method of using his own projectile. K's Ein Trigger to Second Shoot and Second Shell can both easily be punished by ground Musasabi (d charge uf+P into a j.d.B). K' does not jump as high as Mai does, so Mai definitely an advantage in air to air combat. Don't focus too much on jump ins on K's wake up. When possible, go for safe jumps and punish K's DP's. K's DP+C has a huge amount of invincibility and a follow up that causes a hard knockdown (even on standing opponents). This is punishable. Be careful with against K' if he has meter, because several of his EX moves will be come safe and it will be made easily for him to play more offense. Play keep away and poke him out if K' develops too much meter. This match up is actually in Mai's favor, due to her quick movement and long range options. Mai needs to stay at mid range, zone carefully, and exercise good punish combos to win in this match up. Kim tends to lack a lot of ranged options outside of meter. Be careful about conducting air to air combat against Kim if he has meter, because he has EX air qcb+K (which has invincibility), DM's, EX DM's, and qcf+K dive kick at his disposal in that position. Kim suffers from Mai's fire ball (Kachosen) pressure. Kim can be easily zoned out at further ranges. Don't even stay in the corner for too long, because Kim has a very good frame traps from his air qcb+K attacks and his mix up options increase a lot if he does corner his opponents. Stay out of the corner and continue to zone him out carefully. Mai is going to need patience, because Kim's qcb+B is safe on guard, his air qcb+K can cause frame traps and register as a over head, and he can mix up easily in the corner with his f,f+A kick (he can while jump from f,f+A and follow up in the air). Mai can punish Kim's f,f+A by crouching sense the hit detection of that move is high. Mai's command air move d.B Ukihane can beat out Kim's anti-air when she is above him or if it is cross up. Mai can also use Ukihane to safe jump from many of Kim's reversals and punish ideally. Watch out for EX qcb+K (AND the air version). It is possible to hit Kim out of the ground version. To nullify the air version, block the move and the following mix ups accordingly, roll carefully away from Kim, or resort to GC Roll. Actually, Kim does not any invincibility on the ground version his EX qcb+K. Use Mai's st.A to stuff it. This match up can easily go either way because both characters have very good options in mid air. King is made for the sake of conducting good offensive and staple rush down. Both versions of King's Tornado Kick are punishable on guard. They can be safe if they are spaced properly however. Both Mai and King have extremely powerful range options, both of which are executed under different circumstances. It is best to stay at mid range or close range against King. King's Tornado Kick can function as a pseudo anti air, especially her EX version. If King uses st.D, df+D (slide), Venom Strike, she is mostly likely either back dash and use a Venom Strike/Double Strike Super or go for a jump in or a Tornado Kick. React to those moves with regular jump ins. If you anticipate a EX Trap Shot, use j.d.B to slow down you jump and then punish. Hop over King's projectiles if she uses them from far or mid range. You can punish badly timed projectiles by jumping over them. Becareful about jump-in and air to airs because King can go for air Venom Strike on reaction if she does anticipate on Mai jumping in. Mai's air EX DM can beat out her air Venom Strikes. Kula's qcb+K > f+B projectile out-prioritizes Mai's regular projectiles so be on the look out when Kula spins around with qcb+B. Kula can also bypass Mai's projectile's with df+B and her qcb+D so use Mai's projectile with discretion. Kula DP+C can be used preemptively to counteract Mai's jump-ins. If you plan to jump in on Kula, do it from mid range and not the far range. Kula's anti-air options are not as reliable as they appear to be. Kula's DP+A does not have invincibility and her DP+C travels excessively far and extremely punishable and easy to safe jump on Kula's wake up. Keep a little distance. Mai will have a relatively easy time playing keep-away and zoning around the stage with her projectile, her normals, and her ground Musasabi no Mai. Mai can play a lot more offesnively if Kyo has little to no meter. Play more defensively when fighting a Kyo with meter. Mai's A version Ryuenbuu beats out Kyo's Oboroguruma (RDP+K) when used at distance. Mai's A version Ryuenbuu and C/D attack can beat Kyo's Kototsuki Yo (HCB+K). Mai Neo Max can out prioritize Kyo's Neo Max when they are both utilized at the same time. Mai can counteract mid/far distance fireball wars with Musasabi no Mai. None of Kyo's reversals are safe and he can be exposed to Mai's punish combos. A correctly timed Hisobi Baichi can travel over Kyo's projectile. In mid-air, Kyo is far more exposed to Mai's mid-air trics (air throw, high priority air normals, wall kicking, Musasabi no Mai, EX Musasabi no Mai drive cancel/HD cancels, and Ukihane) Kyo's options in mid-air are limited. It is possible to beat out both versions of Kyo's DP with Mai's air command move d.B Ukihane, usually if Mai is right above Kyo or if it is used as a cross-up. Do not use this on EX DP. A successful Ukihane results in a hard knock down. A poorly timed Ukihane results in a hit trade. Mai has a advantage in this match up because, Kyo does not many long range options outside of his EX R.E.D Kick. Play keep away in this match up, because EX Kyo's rekka series are mostly safe and they give him auto-guard, along with his DP. Add variety to Mai's projectiles to keep EX Kyo at bay from full screen. When use qcf+A, EX Kyo will probably resort to R.E.D. Kick which is punishable. EX Kyo's qcf+B upkicks are also punishable, even on the first hit. You can interrupt many of EX Kyo's rekkas as some of them are not true combo's or block strings on grounded opponents. EX qcb+P or EX hcf+K can help in this scenario. EX Kyo has very good reversal options so don't get too reckless with Mai's offense avoid jumping too much. Continue to play keep away and poke him out and punish when necessary. Mai's j.d.B and EX Air qcb+P can work very well here and she has a much better air to air options than EX Kyo does in this match. Both these characters have quite a bit in common: Mai and Leona have very good air control and normal moves in general. They also both have higher damage output and better/safer utilities with meter. Last, they both have a equally dangerous mix up game, while still making very good use of speed and the air. Don't spend too much time in mid air because Leona also has powerful air to air... especially with meter. When Leona has meter, be on the look out for her Vslasher DM/EX DM. Also Leona's Moonslasher is a very good reversal. Use Mai's projectiles to zone her out and start a offense. Use Mai's limbs to cause problems for Leona, but know when to guard. Stay out of reach from Leona. Be on the look out for Leona's ear ring projectiles. Do not get too far on the defensive, because a good Leona player will take advantage of her instant overhead. Don't ever let Mai corner you, especially if she has meter. Mai herself does not have an anti-air and it is going to be difficult to counter act her mix ups. Use st.C, j.C, and both Ryuuenbu variants to keep Mai from jumping in on you. Mai gets weak when she is cornered without meter. Stay close to her and rush her down. Use st.C, st.A and cr.B to interrupt incoming attacks from Mai if she gets too close. Expect a raw Neo Max if Mai is under too much pressure. Stay on the ground whenvever she is in HD mode with 2 meter or if she has three meters with a full drive meter. If she has a full drive meter, don't let Mai get too close. Zone her out, poke, and whiff punish her every chance you get. Mature has a very good projectile with a very good hit box. When Mature performs her qcf,hcb+P fireball, expect her to use her dp+C or run up towards you for hit confirms (j.C or d.B). Simply block and react to Mature's movement and be ready to punish/whiff punish. Don't Mature get too close to you. Her hit confirms are just as good as Mai and Kim's are (cr.B, st.B.). Mature's st.B is two hits, it cancels into special moves and it can be chain cancelled from cr.B. Use d.C, cr.B, or CD attack preemptively and cautiously. Be sure to block all incoming attacks. Mature's block strings can last for quite a while which can easily lead to guard break. Stay out of the corner. Mature's dp+P series are also punishable. Her projectile also has a very large amount of start up, so Mai can counter act before Mature sets up. If Mature begins her block strings with her normal moves and rekka's, be ready to use Guard Cancel Blowback/Roll to safely get out of pressure and construct Mai's offense gradually, while evading Mature's attacks. When pressuring Mature, be sure to go for safe jump set ups with Ukihane (j.d.B), and try to stay one character away. Mai's poke have very good reach and she will be able to block if Mature uses her meter for a EX DP+AC. Mature qcf,hcb+K DM has projectile invincibility so if you are at mid or close range, avoid using projectiles around a metered Mature. Mai's EX air qcb+AC can be used on reaction against Mature's Neo Max. Mai will go straight through the Neo Max and Mai can whiff punish and defend herself after landing on the ground. Maxima options become limited in mid air and at further ranges. Maxima's hcb+D command grab can be punished with a jumping/hop normal move. Maxima has auto guard on his C, d.C, his qcf+A or C, and his qcf+A/C (and EX) DM. Stay at mid range. Mai can also pressure Maxima a little if he is cornered. But, Maxima does has anti-air command grab, which can be punishable if Mai is completely on above Maxima or on the ground during Maxima's anti-air grab. Zone Maxima out carefully, but vary the timing on the projectiles, because Maxima's C normal's, qcf+P, and DM has auto-guard that possesses projectile invincibility as well. EX Kachosen can be a big help in this scenario. Mai's EX DM is also a sure method of outright punishing Maxima as he attacks. There is auto-guard on his signature Giant Bomb so be careful about using projectiles - Raiden can feint the Giant Bomb tackle move as well. Raiden has a lot of safe pressure, so anticipate on him trying to tackle and be prepared to neutral jump. Mai has a great advantage over Raiden in mid air. She also avoid the tackle by back dashing. He can be whiff punished this way if he tries to attack again. Also, the ACTIVE frames of his Giant Bomb can be stopped by Mai's projectile at the moment he is rushing at you. Always maintain a safe distance between yourself and Raiden. Go for cross-ups whenever possible. Raiden has a anti-air grab so be on the look out for that. Raiden's Neo Max is also extremely punishable on block and can be easily safe jumped, especially if he is in the corner. Ralf's air qcb+A and C are overheads. Mai can either guard high or quickly jump backwards if she anticipates this move. If Mai does a neutral before Ralf gets ready to use air qcb+A or C she can punish him after he lands. Ralf's b charge f+P and both of his DM's are extremely punishable. In order for Mai to win in this match up, Mai will have to patient but she also needs constantly be on the move. Ralf can easily be zoned out with Mai's projectiles. Use them wisely and look out for Ralf's jump ins. Keep in mind that Mai has an advantage in mid-air sense Ralf's mid air options are on the slow side. Mai can also use the wall jump reliably in this match up as well to out maneuver Ralf. This is an even match up, so Mai can get away with an offensive or defensive play style. Mai has better air control and ability to zone however, but Robert has every necessary tool at his disposal. Most of Robert's tool however have particularly nasty holes in them which Mai can capitalize. Robert's projectiles can easily be counteracted by EX qcf+AC or ground Musasabi no Mai into j.d.B > air qcb+A ( > EX qcb+AC) mix ups. Robert's A version DP Ryuga special move has no invincibility at all so Mai can capitalize here. Mai also has a easier time baiting DP's due to the nature of her jumps. The C version of Robert's Ryuga is normally meant for stopping super jumps. Mai's projectiles beat out Robert's Heinshippukyaku (D Heinshippukyaku is not safe on guard). Mai's A version Ryuenbuu and several of her air attacks (including air d.B) out prioritizes Robert's Heinshippukyaku. Robert's command throw is not 1 frame so it is easier for Mai to continue with offensive pressure using short hops or high priority moves. Mai has a much better keep away game than Robert does and she shut many of his offensive options down at mid-screen and if Robert is cornered. Robert has a air command move that can be used as an auto-cross and leads into combos. Roll out of the way if you anticipate this. Ryo's attacks become limited on a far screen, outside of his DM Projectile. Carefully zone him out with Mai's projectiles. Mai should not jump too much - Ryo's qcf+A and DP function as very good anti-airs. She should anticipate these and go for cross-ups instead. Ryo also has high and low parries which will allow him to gain frame advantages if he uses them correctly. Stay at mid range and focus on safe pokes and punishes. The qcb+K series from Ryo is not very safe but can be good options for counteracting Mai's hops. If Ryo is close to you, be sure to block his attacks -- he has a very a good overhead, much like Claw Iori, Kim, and both of the Kyo's do. In the air, Mai can out maneuver Ryo and apply her mix up game to advert Ryo's parries altogether. Ryo's EX Ranbu (EX qcf,hcb+AC) is punishable also punishable. Bait out Ryo's special moves and punish/whiff punish Ryo appropriately. This is arguably easier than the Ash match up but Mai needs to keep her distance. Saiki does not have an real EX projectile, and Mai can out prioritize Saiki's projectile with her own. EX Kachosen helps a lot in this scenario if she somehow gets into a projectile war or if the player predicts Saiki will use a projectile first. Saiki can normal bait out a lot of moves with his air normals, but Mai does not have anything to bait out. Mai can zone him just fine with her normals and her projectiles. Saiki's DP+D has invincibility on it's start up (the B version does not), but the way it travels makes very unsafe - Mai can safe jump or she can completely avoid this move by jumping above/behind Saiki, going for cross ups. Mai will have trouble if Saiki gets too close. Mai's ground Musasabi no Mai should be used to escape bad situation. Don't jump around too much. 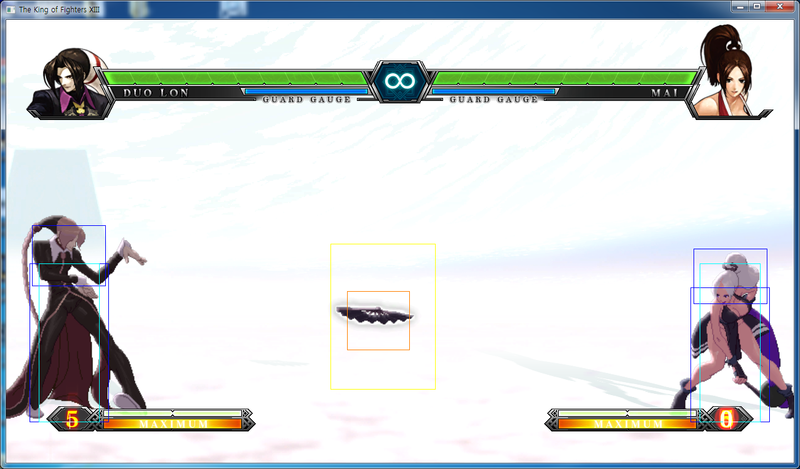 Saiki has a lot of anti air options... most of which CAN be baited. Mai can change the trajectory of her jumps with her j.d.B Ukihane. Mai's ground Musasabi no Mai can not be whiff punished easily either. Mai needs to also attempt as many knockdown's as possible to stay on the offensive. If Shen Woo attempts his BnB st.C, f+B, qcb+A, qcf+A, guard high. Shen Woo's qcb+A is a overhead. Shen Woo's qcf+C is also punishable, even if it is not charged. Shen Woo is easily zoned out by Mai's projectiles but if Shen Woo has meter, use some discretion and try to bait out his DM and block it - it is unsafe on block, but it has projectile invincibility and high priority. Mai can stay in mid-range from Shen - Shen does not have very options anti-air, so while retaining good range, Mai can go for her mix ups and rush Shen down gradually. Be cautious of Shen's command grab. Retain Mai's range. Mai should not have problem dealing with Shen in the air. Pressure Shen Woo from the air if he ends up cornered - but, still maintain some range in case he uses his EX DM, command grab, or if he tries to jump or roll away from you in the corner. Do not let Shen Woo rush you down - he has a very good damage output on many of his moves and his combos become damaging in the corner. It is Mai who should applying the pressure. This is one of the more trickier fights for Mai. Be sure to punish poorly timed projectiles by jumping over them and doing jump in combos. Many of Kensou's reversals are not safe, and Mai has many safe jumping tools at her disposal. Use Ukihane while in the air to trick Kensou into performing his rdp+K anti-air and punish him. Keep a safe distance from Kensou as his hit confirms (cr.B) offer him generous combo opportunities. Make use of both versions of Ryuuenbu and her CD/j.CD attack - these moves give Mai a brief period of low invincibility as she attacks. Kensou has a DM that functions as a command grab, so if Kensou has meter, maintain a safe distance and poke him out. Don't let Kensou tick throw you in the corner; his throw can actually lead into juggle combos. Stay out of the corner. Kensou's d.D also has very good range too. Takuma is very meter heavy, perhaps more so than Mai is, though he has better damage output than she does at mid screen. Mai is weak under pressure, and Takuma is meant to establish high pressure and becomes very dangerous with meter. However, due to the nature of Takuma's game play, Mai can also get away with playing a more offensive game as well but she needs to play more cautiously against a Takuma with a lot of meter. The B version of Takuma's Heinshippukyaku is safe on guard but his D version is not. Mai's Kachosen. Remember to keep your distance and that Mai dominates in the air in this match up - Takuma has a very good command throw that can change the match in his favor. Remember to use high priority moves. If Mr. Karate gets too close, interrupt his pressure with st.A, st.B > st.D target combo, j.A, and st.C. Use st.D preemptively to beat out his hopping moves from mid range. Mr. Karate does not have many moves at longer ranges. Zone him out with Mai's projectile but if Mr. Karate has meter, resort to using qcf+A. Mr. Karate has a move that allows him get closer for rush down. Retain mid range until you can corner him. Mai does a lot better in this match if she is at the middle of the screen or if she corners Mr. Karate. Mr. Karate's normal moves does not have much reach, take advantage of Mai's pokes and EX qcb+AC. If Mr. Karate starts pressuring too much, Mai can go for a st.A. Mai can avoid Mr. Karate's j.CD by rolling and hopping backwards. If she gets cornered in the process she can either resort to wall jump into Ukihane, block, roll, perform A Ryuuenbu, EX Ryuuenbu, st.A, st.C if Mr. Karate intends to continue adding pressure. Mai's j.A and st.C can interrupt Mr. Karate hop pressure. If Mai is at mid range be on the look out for Mr. Karate running command grab - perform a short neutral hop and use a whiff punish combo. Again, Mr. Karate is very versatile even in the air. Mai has an advantage in the air. Mai can use j.A, air EX qcb+AC or her EX DM for air to airs. Mr. Karate does not have many good long range options outside of meter, but he can use his EX counter to hurt characters for using projectiles. If Mr. Karate is at mid or far range with meter, Mai should time her projectiles carefully or simply resort to qcf+A to bait something out or await a reaction. Punish Mr. Karate's qcf+P with Neo Max. Otherwise, if he uses qcf+P in a block string, now would be a good time prepare an offense. Mr. Karate is negative on block. Rush Terry down, but use discretion against Terry and look out for Rising Tackle and Crack Shoot. Do not crouch guard if Terry uses his Crack Shot. It will frame trap Mai if she is crouching while guarding against Crack Shoot. Crack Shoot can also be used as a pseudo-anti air. Crack Shoot is punishable on guard. Mai needs to be careful with using cross-ups on Terry's wake up, because Terry has one of the best anti-air options for counteract such jump ins. Go for hops and time your jumps so that you can still bait out Terry's Rising Tackle/EX Rising Tackle and conduct a good punish combo. Stay out of range of Terry's normal. Terry's combo become more devastating if he has meter and drive. If Terry has both meter and drive, stay at mid range. When Terry is on the move the ground, CD and j.CD works very well here. A Burn Knuckle is relatively safe, but the C and EX version are not. Terry will likely go for this C Burn Knuckle while you are back dashing or jumping backward. Bait this out as you are in the air. Terry becomes helpless in mid air, so take advantage of Mai's abilities in the air. Hop over Terry's Power Wave, he is relatively easy to punish when the timing of his Power Wave is poor. Terry's df+C and st.D can be used as an anti-air so becareful about using direct jump ins. Keep in mind that Terry's C Power Wave can stop ANY of Mai's projectiles, but it is also very punishable and has a bit more start up than a A Power Wave. Vice can be zoned out by projectiles, but look out for Vice's Splash, because she avoid Mai projectiles if they are poorly timed. Vice's Splash is easy to punish in the air if you are jumping because that move will only work on grounded opponents. Keep your distance, because Vice is a grappling character. Vice's st.D can function as a good anti air but in general it is hard for Vice to avoid pressure, especially in the corner - Don't give Vice any momentum because her EX Sleeve will catch Mai even if she is in a reset or hit by a CD move. Rush Vice down. Vice has extremely good EX moves. Vice's EX qcb+AC shoulder tackle has high invincibility, priority, fast start up, and relatively safe on guard. At mid range, stay on guard and evade Vice's Sleeve attack. Put emphasis on jump ins and cross ups whenever possible. Counter Vice's jump in's with Ryuuenbu, EX DM, st.C, j.C, or Air Throw. Vice does not function very well in the air at all, but she does have a very good CD attack, much like Takuma/Mr. Karate does. Yuri has a one frame command grab so don't get too reckless when applying pressure to Yuri. If Mai is close to Yuri be cautious of Yuri's dive kick pressure (Yuri's dive kick can be done with air df+B or using D during her DP+K Demon Flip motion). Yuri's DP+K > C is SAFE, so get ready to tech throws or guard low if Yuri uses this and if Mai guards Yuri command jump in. Mai CD and j.CD works spectacularly in this match up, due to Yuri's lack of options in mid air outside of her dive kick. You can also counter act Yuri if she jumps from mid or far ranges with A or C Ryuuenbu. Yuri's EX hcb+K, EX DP, and EX DM (qcf, hcb+AC) will all go through Mai's projectiles. Use more discretion towards Mai's projectiles if Yuri has meter. Mai needs to be either close or far away from Yuri to stay affective, because Yuri has a lot good options at mid ranges. This page was last edited on 15 December 2014, at 20:04.